One of the great Agendio features is the ability to add your personal activities and events to your planner according to your schedule. But you have limited control if you want to show them on one page frequency, such as daily, but not on another, such as monthly. We have been asked if we can do something about this. We aim to please, so we have now added the option to choose whether your activities, events and holidays will be printed on your monthly, weekly or daily pages. Not only that, we added the option to make that choice for each activity and each event. We now provide you with checkboxes on each line where you enter your activities and events and you can fill them for each frequency according to your preferences. You can decide that “Clean bathrooms” goes on your daily pages every Saturday while “Backup computer” goes on your monthlies every 15th of the month while “Yoga” goes on both every Tuesday. Or you can show your anniversary date on your monthly, weekly and daily pages but birthdays only on weeklies. 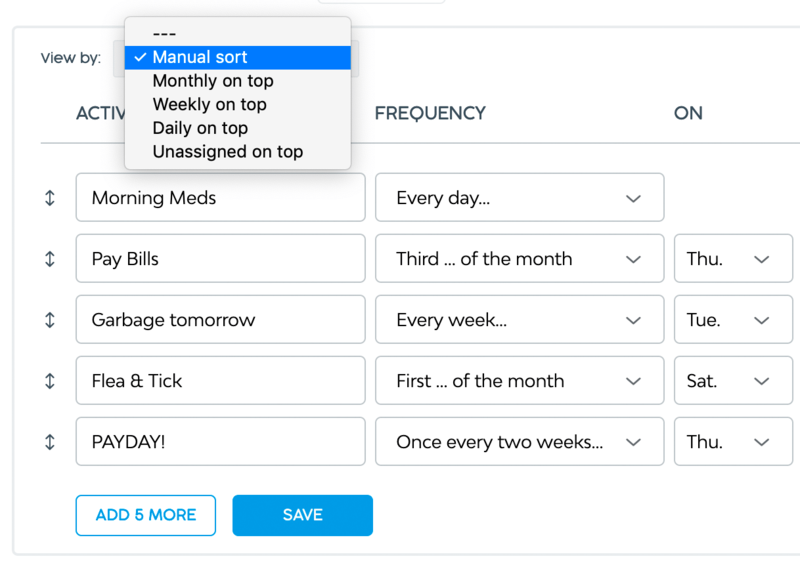 With all this increased customization, we realized that you would benefit from some additional tools to keep track of what you customized: So we added a sorting feature that allows you to sort by frequency, or to keep similar items together in a manual sort by moving your entries manually up and down with the two headed arrows on the left of each screen. 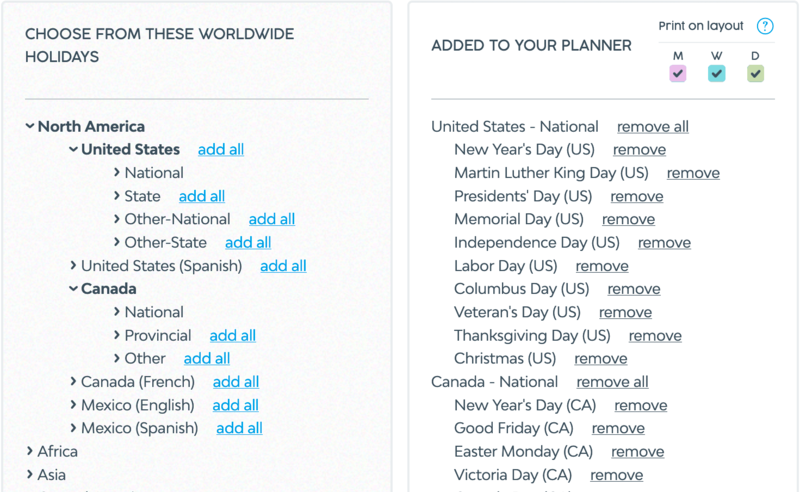 We also upgraded our Holidays customization. Holidays work a little differently: You can assign the pages on which they appear, but only for the entire list. We feel this makes sense, because we can’t see a scenario where you would want some holidays on monthly pages and others on weekly pages. So for this option, the checkbox is at the top of your selected list on the right side. Please note that in order to implement this update, we had to create new master files for each of your activities, events and holidays. So if you’ve created many different lists over the years, you may find that you want to delete some entries before your next purchase. As always, let us know if you have any suggestions or any questions.